So the inspiration behind entering this competition isn't inspiring, it was really just a challenge to myself to actually finish a project for once. But I hope it turns out well. I'm not an experienced world builder with many projects under my sleeves so don't go looking for them ;-). A bit about me: I'm 15 and Unity is one of my hobbies (as in I still have to try and fit it in with school work and exams), I live near Switzerland, where I go to school. I've been working in Unity for 2 or 3 years now and have been developing my skills in all fields related to game development since. I do this all by myself unless otherwise stated. Of course I started by gathering references into and making (assembling) concept art. I like to keep everything in one place so I made a massive psd with everything in it. In the top left you can see my concept art and some notes about themes I was considering exploring. Below it is a basic storyboard, really poorly illustrated but it helps me later when I need a sense of how many of what model I need. On the right are some references I liked; I think, referencing to these is often in all stages is important to allow for them and there styles to engrain themselves into the work. After this I made a onenote document with a checklist of some of the tasks I needed to do, ideally, you should stick to this religiously, but I didn't, idea for improvement though I guess. So I started by gathering some assets from previous projects and the asset store to give myself a palette to work with. I keep some of my favourite asset store assets in my wishlist, I imported the standard: post processing, Cinemachine and some textures and materials. I also imported some assets from other projects, such as my procedural road generator, and some materials and textures. Of course I needed to go brows the asset store for some more assets for this specific project. I found a nice set of satellite dishes and aerials, a nice building and some industrial textures. Threw together some boxes in unity for blocking and to test and refine the lighting (I used some volumetric lights from GitHub). I then started modelling a few objects to use in my scene. When modelling I wanted to focus on modularity such that I could reuse buildings and objects more than once. Once the preliminary modelling was done, I started assembling the scene, gathering more assets as I needed them, here it's really a lot of make something rough and refine it until you like it. So a bit of explanation for this image. The tube lights are tubes with an emissive material on them. Originally that was it but the tube lights weren't casting enough light onto other surfaces so I imported an implementation of tube lights which supplements the emission. The buildings are simply cubes with a fancy material on them. In this picture the windows look weird because of a bug in the shader, see the other picture below where they work. Right, more about the fancy shader; the shader is a custom shader which implements interior mapping (see: Unity Interior Mapping (Forums) ), with it I simply need PBR textures for the face of the building and a cubemap for the room inside and the shader does the rest. About the material design and how that worked out. Most of my materials use the unity standard shader almost all of the albedo textures come from Textures.com, which while it doesn't always have the highest quality textures (and most only are diffuse textures), the choice of textures is far more important in my opinion. As such, I usually have to do some photoshopping on the textures and I have to create other maps (normal (always), roughness (always), height, metalness, emission, occlusion). For normal map creation, tools such as Crazy Bump can help when creating normal maps, but either way lots of tweaking in photoshop is usually required. Within Unity itself, making the materials themselves was relatively simple, I just assigned all the maps to the material and tweaked any small settings to my taste. Here I wanted to really flesh out the entire scene and start bringing all the elements together into a cohesive scene. I did some more modelling to make a new bridge to add to the verticality of streets. I created a very simple c# script to spawn in flying cars and make them travel across the scene. I duplicated some more buildings to fill in the distance and added some more details. Ideally I would have had more detail elements and buildings to use here (at this point all my buildings were default unity cubes with a nice material on them), but due to poor planning and a general lack of time I couldn't model any more. Animating. 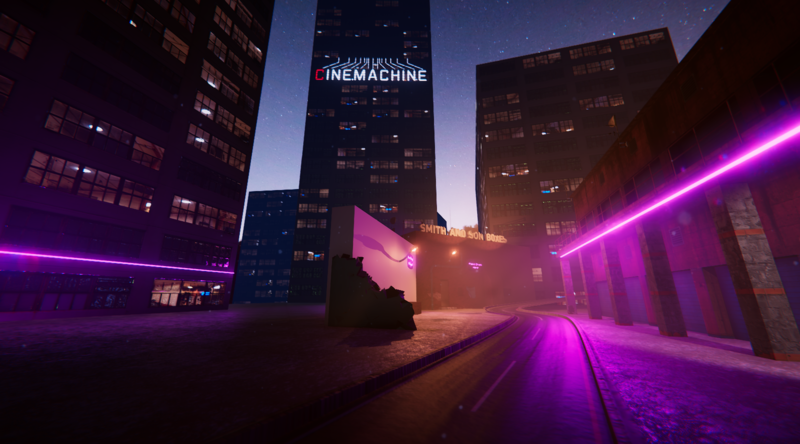 This is where Cinemachine and Timeline really come into play, this was my first time using both and all I can say is that they were amazing, Cinemachine especially, it was so polished and fully featured. Timeline on the other hand was very good though the overall user interface could be improved (look at features from Adobe Premiere Pro and the like). But anyway, this is about how I used them in my project. I started by creating few virtual cameras in Cinemachine to get various shots. I utilised the Cinemachine composer and noise modules heavily for this project heavily. The composer is extremely powerful and makes designing my shots so much easier. I used it to frame shots perfectly and by using the soft zones and dead zones, I had great control over the camera angles with having to meticulously animate anything. Timeline was used to animate the drone and sequence the camera shots. I really appreciated the fact that you can edit the timeline sequence while playing and in fact scrubbing works while playing too really nicely. This makes timing cameras with the music much much easier. After that was all done, I passed it by a few family members and friends for Q and A before building and recording. Finally. Done. I spent way too much time on unimportant things in this project and being my first big full scene building project in Unity didn't help either. I like the way it turned out, I think the atmosphere is great and the theme in general is all there. I could have put more effort into making more models, especially for the buildings, but even without it looks great. For a passion project in my (limited) free time it turned out great. I have learned a lot from doing this, not only learning new tools but also retrospectively in terms of how much of what kind of assets I needed (if you compare the list of what I thought I needed to what actually ended up in the scene there is a massive difference). Overall though, this was great fun and I'm happy I've got something to show for it. If anyone thinks I missed something here please leave a comment, it's really hard to keep track. Note: I did plenty of debugging, not included in here and glossed over a few things, if you have questions, leave a comment and I'll update the article. awesome this render has the most effort, work and pation.